” . . . the matter of which you write is most difficult and perplexing. Josephus Daniels, 1862-1948. Secretary of the Navy, 1913-1921. Typed Letter Signed, Josephus Daniels, one page, quarto, on stationery of the Secretary of the Navy, Washington, [D.C.], July 18, 1918. 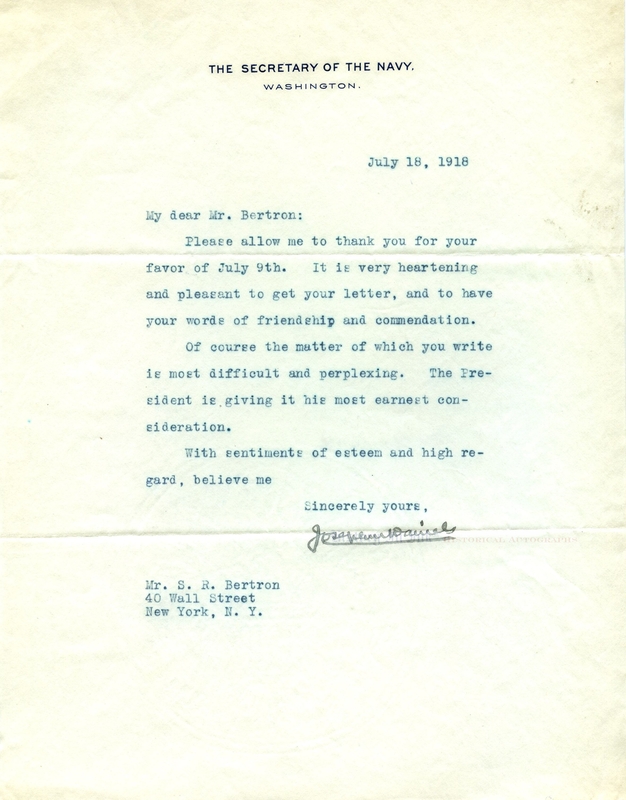 Daniels thanks Wall Street financier S. R. Bertron for his letter, noting that President Woodrow Wilson was considering the "difficult and perplexing" matter about which Bertron wrote. In full: "Please allow me to thank you for your favor of July 9th. It is very heartening and pleasant to get your letter, and to have your words of friendship and commendation. / Of course the matter of which you write is most difficult and perplexing. The President is giving it his most earnest consideration. / With sentiments of esteem and high regard, believe me . . . ."
The letter has normal mailing folds, one of which affects the signature, and a tiny bit of soiling that is less apparent than the scan shows. Overall the piece is in fine to very fine condition.